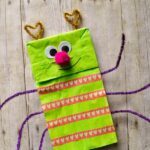 Did you know you can make a cute little book out of paper lunch bags? Really, it’s super simple! 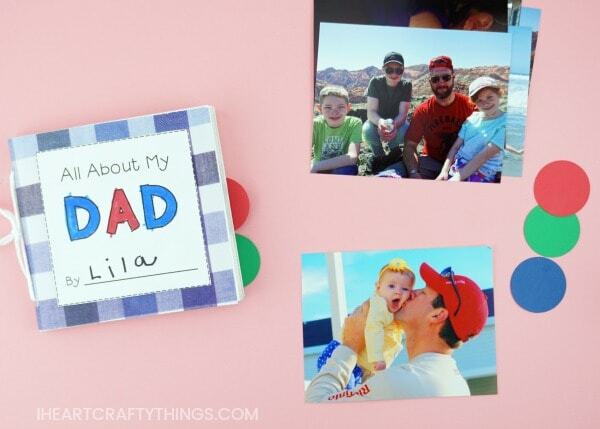 Keep reading to see how we turned three paper bags into a darling DIY Father’s Day book. To make the book extra simple we made a template for you to customize your Father’s Day book for dad, grandpa or papa. 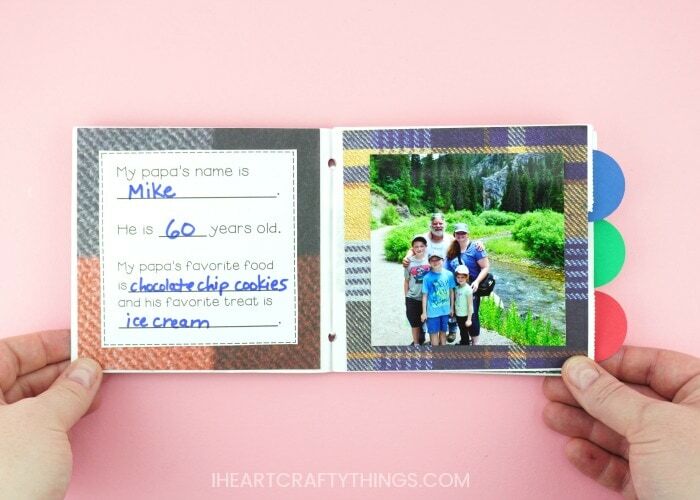 This DIY Father’s Day book is a special keepsake dad, grandpa or papa will treasure forever. 1. Begin by layering three paper bags together. Use the pictures as a guide below. Lay the first bag with the bottom flap facing up. Then layer the next bag with the bottom flap upside down and on the opposite end. Layer the third bag like you did the first. 2. 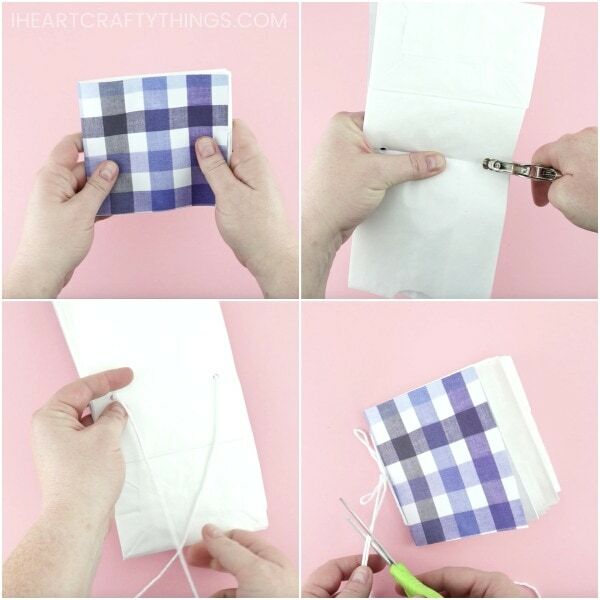 Use a paper bag as a template to cut out a rectangle from your patterned scrapbook paper for a book cover. Place the cover at the bottom of the three paper bags. 3. 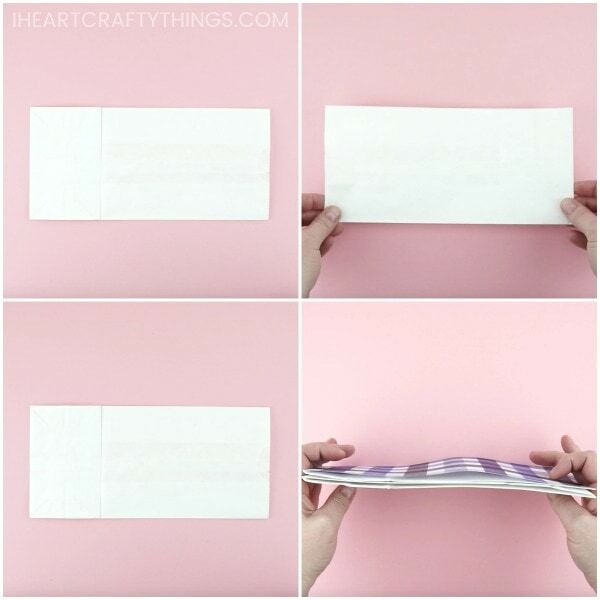 Fold your cover and three paper bags in half. Then open it up and place a hole punch on each end along the fold line. 4. Cut a long piece of white string. Starting on the outside of the book, thread each end of the string down into one of the holes so they come out in the center of the open book. Next thread each string in the opposite hole so both ends come out along the outside seam of the book. Tie a knot, bow and double knot in the string along the seam of the book and cut off any excess string. 5. Use an extra strength glue stick to add glue to the back of the cover and glue it down onto the front and back of the paper bag book. 6. Cut ten 5-inch x 5-inch square pieces of scrapbook paper. 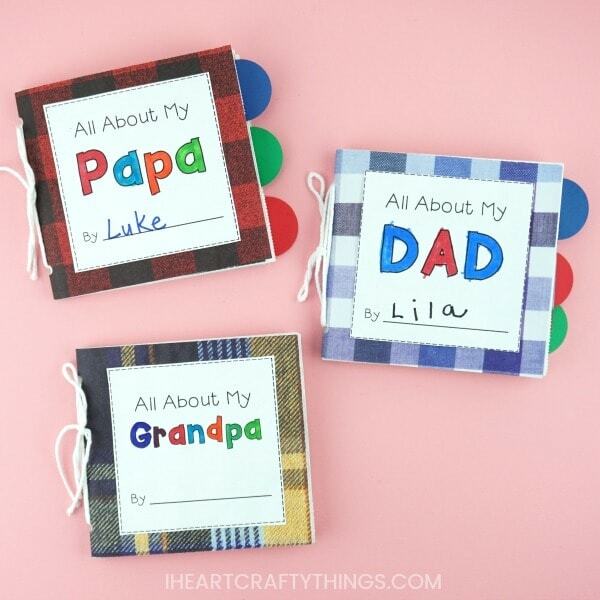 Glue them onto the inside pages of your paper bag Father’s Day book. 7. Download and print out our Father’s Day book template. We have a variation for Dad, Grandpa and Papa. Cut out each of the squares in the template. Have your child use markers or crayons to personalize the pages of the template. 8. 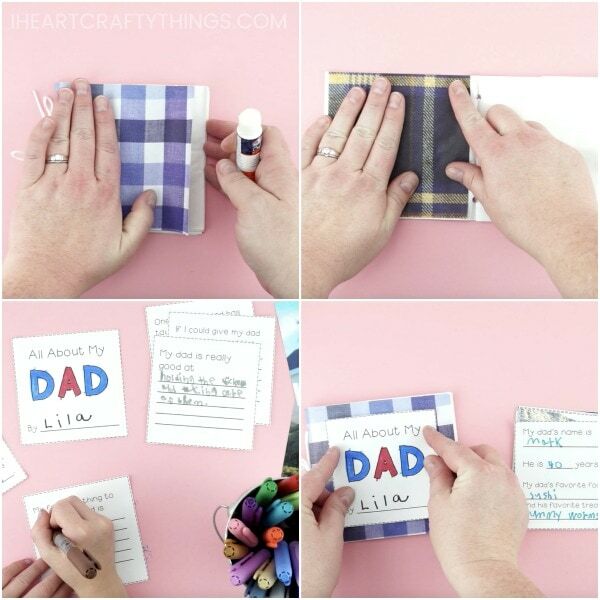 Print out five photos to go along with the pages of your paper bag Father’s Day book and cut them into 4-inch x 4-inch. 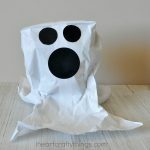 As an alternative you can use blank paper and have children draw pictures inside them. 9. 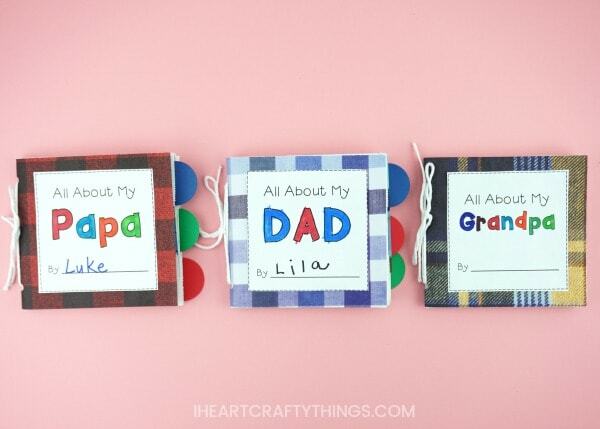 Glue the template pages and pictures on the inside pages of the Father’s Day book. 10. Now it’s time to fill the open pouches on the inside of the book. Print out three photos (I find that a 4×6 photo works best, cut down to 4×5). Cut out 1 1/2-inch circles from colored cardstock. Glue one half of the circle onto the back of the photo so the other half sticks out of the photo. Place the photos inside the three pockets inside the Father’s Day book. You can stagger the circles on the photos (top, middle, bottom) so that you can easily see them from the outside of the book. The circle tabs make the photos easy to pull in and out from the Father’s day book. 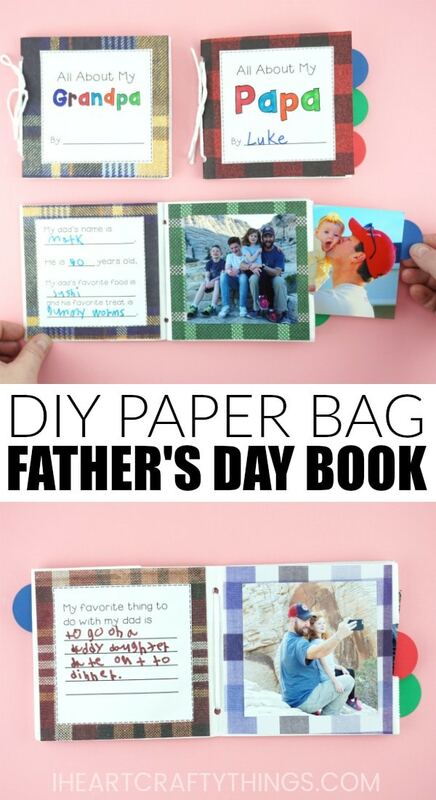 Your paper bag DIY Father’s Day book is complete! 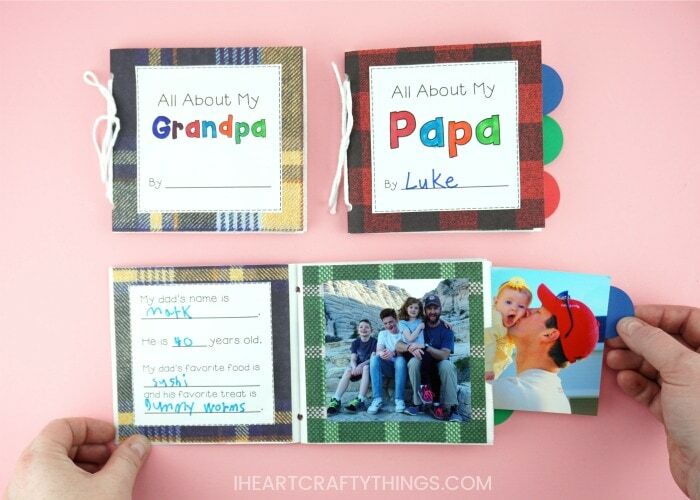 Dad, Grandpa or Papa will open their book and Father’s Day and will grin from ear to ear of the cuteness. It’s a Father’s Day keepsake gift that they will keep and treasure forever. 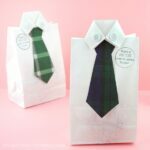 You can make this fun DIY Father’s Day gift bag to accompany your cute Father’s Day. It’s a fun spin on the traditional dress shirt and tie card. This super dad Father’s Day gift is another fun way to make Dad or grandpa smile. Fill in the template on the back to let them know what makes them super. Have an out of this world Dad or Grandpa? This alien Father’s Day card is perfect for them!